Grass Magic is a high performance lawn fertilizer with a Lawn Restoration Formula not found in any other lawn fertilizers. With an NPK of 15-0-7 it contains primarily organic materials with a small addition of urea to allow for a quick green-up in the spring. Unlike most lawn fertilizers, it also contains kelp and seaweed materials and has beneficial soil microbes to help grass plants better absorb the nutrients. Grass Magic lasts for 12 to 16 weeks providing food for your grass plants. Soluble fertilizers on the market release their nutrients in a brief spurt after water is supplied. This onfent causes stress to the turf grass by forcing plant growth at the expense of root development and plant vigor. Unlike soluble fertilizers, the nutrients in Grass Magic are released only as they are needed by the plants, so they continue to be effective over a much longer period of time. In addition to providing plant vigor and stress resistance, the insoluble nature of Turf Nurture products is far less susceptible to leaching and run-off than are the soluble fertilizers. 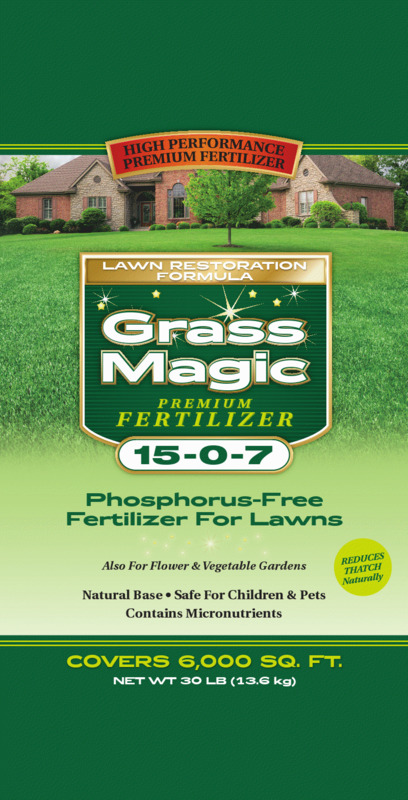 Grass Magic is usually only a regional product available in Michigan, Ohio, and Indiana. It comes in a 40 pound bag that will cover 8000 square feet. Starting recently, it can be found here on Amazon.com as well.